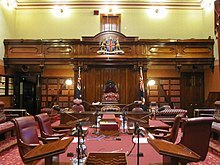 The New South Wales Legislative Council is the upper house of the parliament of New South Wales in Australia. The lower house is the Legislative Assembly. Both sit at Parliament House in the state capital, Sydney. The Council has 42 members. Each member serves an eight-year term. Half of the members are elected every four years. This page was last changed on 23 July 2017, at 04:57.